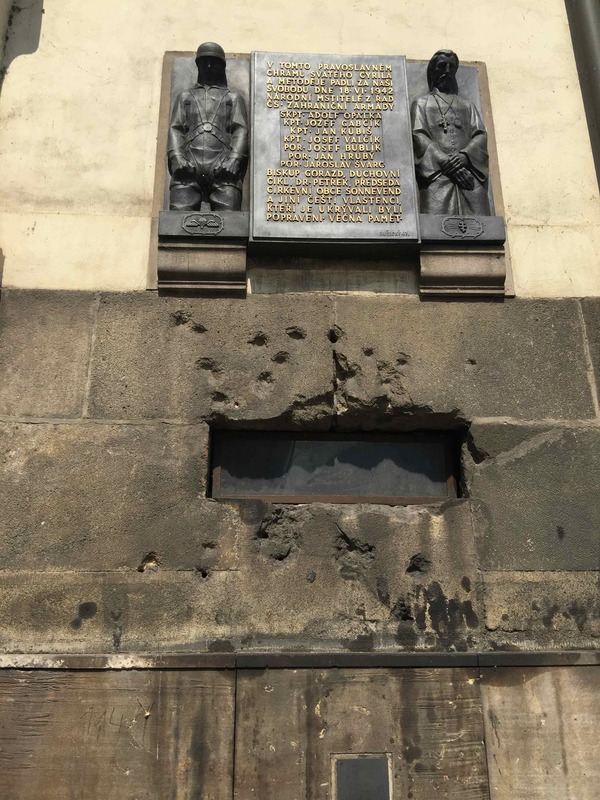 The National Memorial to the Heroes of the Heydrich Terror is a living, breathing testimony to how the efforts of one person (or seven people) can truly rewrite the ending to one of the world’s most awful stories. Background: Adolf Hitler was evil, no doubt, but Reinhard Heydrich was arguably worse. Heydrich is considered to be the “architect of the Final Solution,” to exterminate every member belonging to European Jewry. He was the Chief of the Gestapo, and essentially Hitler’s right hand man. Prague was occupied by the Nazi regime and was leniently governed since Czechs were making materials the Nazi regime was using. Heydrich decided the soft governance was misplaced, and decided to manage the area with absolute ruthlessness. Meat: People in Prague were developing resistance strategies. They were pissed. Seven men (called Operation Anthropoid) decided to assassinate Heydrich to prove that men at the top of the Nazi pyramid were not untouchable. They watched Heydrich take his route from his home to Prague Castle (where he ruled) every day for weeks. Heydrich lived up a steep, curvy road and the plan was to shoot Heydrich as the car slowed to make it through the curve. Problem: When Heydrich’s car slowed around the curve, the assassin’s gun jammed. Heydrich spotted the assassin and ordered the car to stop. A second assassin threw a grenade at the car, sending shrapnel into Heydrich’s arms and legs, but it wasn’t enough to kill him. Heydrich was operated on through countless hours and appeared to make it through the surgeries just fine. However, right after he ate his first meal post-surgery, he went into shock and died. Meanwhile, the assassins were convinced the mission to kill Heydrich had failed. They went into hiding to regroup. The members of Operation Anthropoid were loyally hid in the church of St Cyril and Methodius in Prague until they were betrayed. 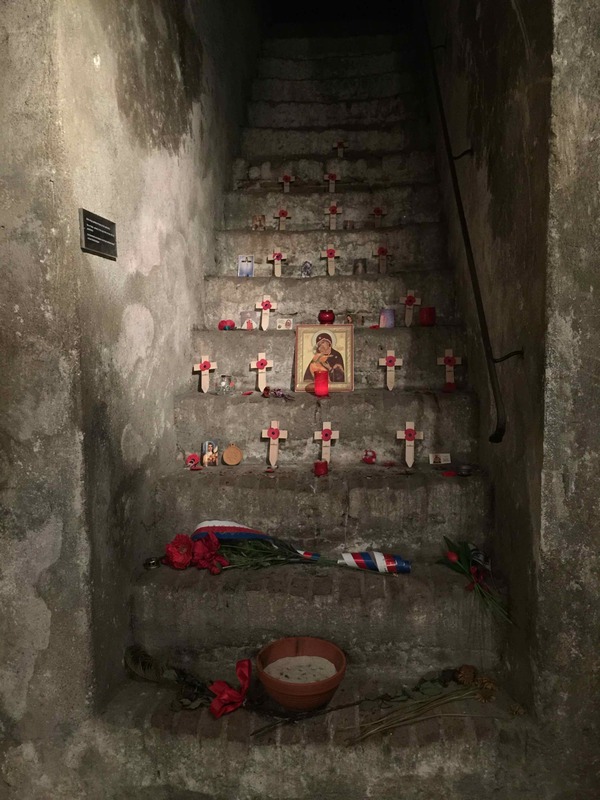 Nazis raided the church and three of the seven men were killed in the prayer loft. The other four fled to a crypt below the church. The Nazis opened fire from the outside until they discovered this tiny window that opened into the crypt. The crypt was flooded with tear gas and then with water provided by the Prague Fire Department. The four committed suicide. The man who betrayed the members of Operation Anthropoid tried committing suicide, but was ultimately hanged. Present: You’ll see bullet holes in the wall, shrapnel remains, and what we’re pretty sure were blood stains on the floor and walls. You’ll see evidence that the men, before committing suicide, tried desperately to create another way out. It’s harrowing. For less than the price of a coffee or tea, you can see and feel what the men who rewrote history saw and felt in the moments before they chose their fate. Please click here for directions and hours of operation. It’s about two hours to read the information (in both English and Czech) and move through the crypt. The church was not available to move about inside, but you can peer in through thick clear glass.